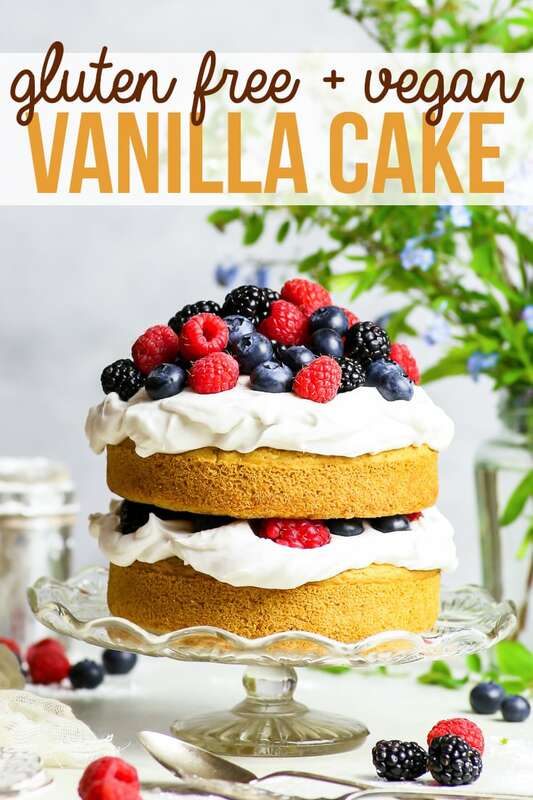 This gluten free vegan vanilla cake recipe is THE recipe to have on hand if you have any kind of food allergy or intolerance, or if you follow a vegan lifestyle. With a fluffy, moist sponge cake (no egg substitutes!) 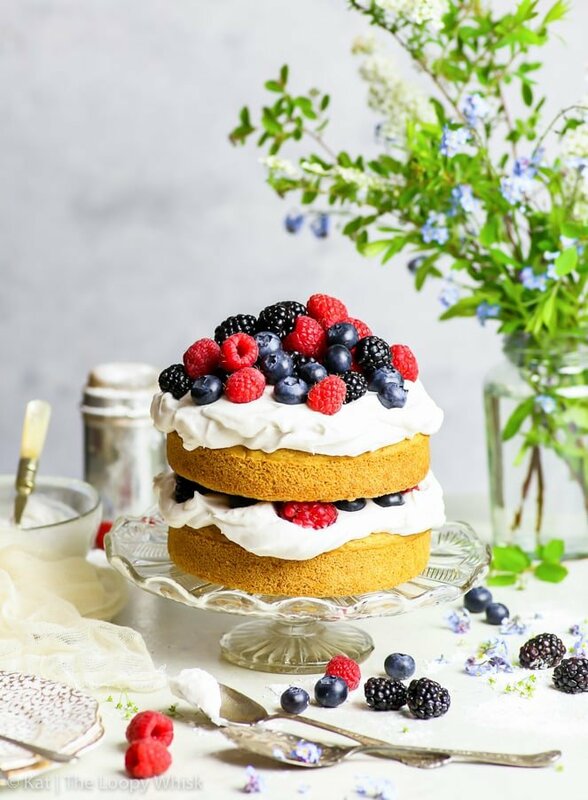 and a delicious coconut cream frosting, this basic recipe can be modified to make other types of cake, as well (think coffee, or red velvet)… but this simple vegan vanilla cake version with summer berries is pretty spectacular on its own. A cake with no eggs, no butter, and no wheat flour. Huh? Yes, we’re kinda removing the crucial bits that make a cake… a cake. And listen – I get your scepticism and your doubts. And if you’ve had a gluten free+vegan cake fail before, I feel your frustration too. But here’s the thing: even if you can’t eat gluten, eggs and/or dairy, you still deserve an epic kickass cake. This is it. It’s a basic gluten free vegan vanilla cake recipe, that can be modified and tweaked to your heart’s content. You can add flavours and colours and layers, and go absolutely nuts with the toppings. But the basic recipe itself is ridiculously easy and quick – and 100% reliable. It works every single time, and anyone can make it. There’s no fancy techniques, no weird hard-to-pronounce ingredients, and… no egg substitutes. Have I mentioned it’s super duper pretty? I flavoured my vegan vanilla cake with extra lemon zest because it was all grey and dreary outside, and lemon zest always brings summer and sunshine to my mind. (And it tastes so good, I definitely recommend you do the same!) 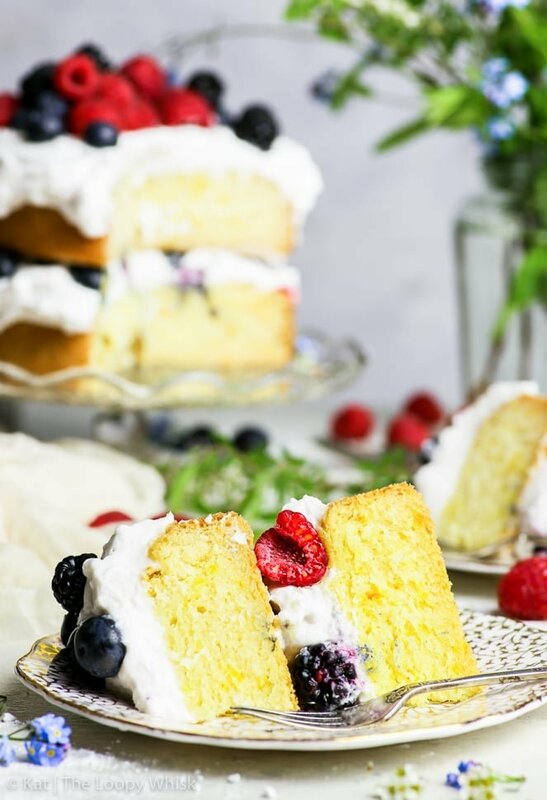 I kept the flavours simple, with a vanilla coconut cream frosting, and a whole heap of summer berries both in the layers and on top of the cake. And… it looks like summer, doesn’t it? Like it should be the centrepiece at a July picnic or a summer party, surrounded by flowers of all colours, chilled lemonade and the kind of sunshine that makes you squint and laugh. A question I often get is whether my recipes are actually easy to make. Like if it looks that good, surely it can’t actually be simple to prepare. And… sometimes it’s difficult to answer, because I don’t know what your baking experience is. Have you made a bazillion birthday cakes and chocolate chip cookies, or are you at the “burns water” cooking skill level? That’s not the case for this recipe. I know the answer for this one. 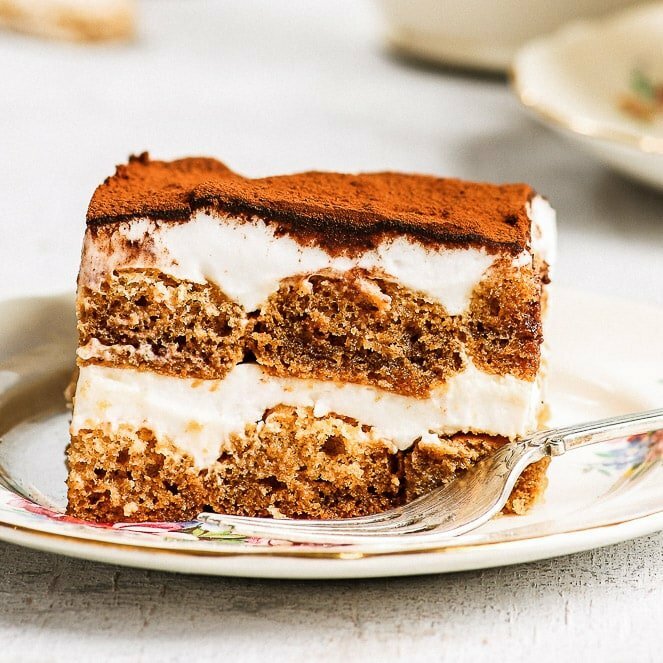 If you can measure the ingredients, stir them together, set the oven to the correct temperature and bake the cake for 35 minutes – then you can make this recipe. That’s all there is to it. Measure out the dry ingredients, measure the wet ingredients, stir, bake. I seriously can’t think of an easier recipe. This gluten free vegan vanilla cake contains no eggs, no dairy and no gluten. It’s fluffy and moist and it tastes like cake. The coconut cream frosting is delicious. 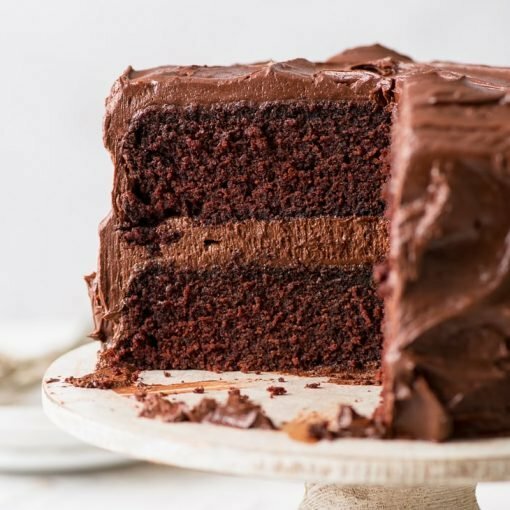 And when you eat this gluten free vegan cake – it doesn’t feel like deprivation, or like you’re missing out. It feels… normal and tasty and, yes, that second piece is totally a good idea. 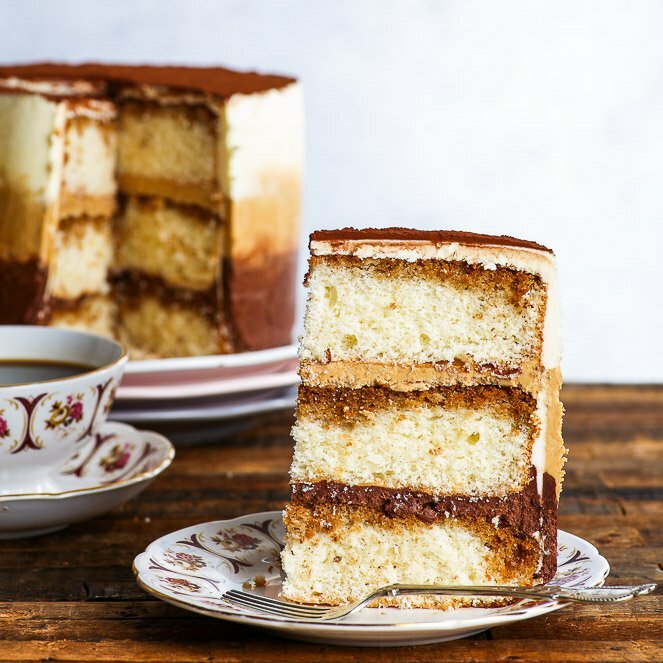 This gluten free vegan vanilla cake recipe is THE recipe to have on hand if you have any kind of food allergy, or if you follow a vegan lifestyle. With a fluffy, moist sponge cake (no egg substitutes!) 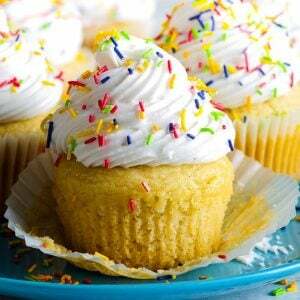 and a delicious coconut cream frosting, this recipe is both quick and easy! Pre-heat the oven to 355 ºF (180 ºC) and grease two round 6 inch (15 cm) cake tins with vegetable oil. You can also line the bottom of each tin with some baking/greaseproof paper. Mix all wet ingredients together and add them to the dry ingredients. Mix well until you get a smooth batter with no flour clumps. Divide the cake batter evenly between the two greased cake tins and bake in the pre-heated oven at 355 ºF (180 ºC) for about 35 minutes, or until golden brown on top, springy to the touch and an inserted toothpick comes out clean. 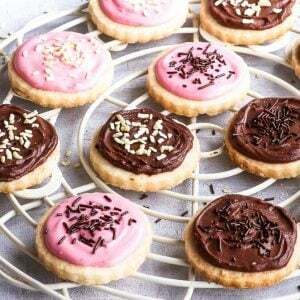 Remove the cakes out of the tins as soon as possible and allow to cool on a cooling rack. In a stand mixer with the whisk attachment, or using a hand mixer with the double beater attachments, whisk the coconut cream, powdered sugar and vanilla paste together until fluffy. Place one of the sponge cakes on a cake stand or plate, and spread 1/2 of the coconut cream frosting on top. 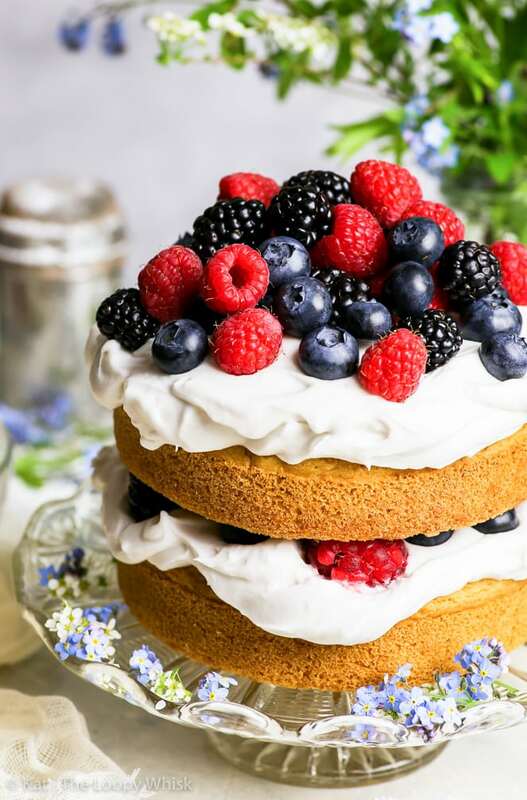 Scatter a handful of berries on top of the frosting in an even layer. 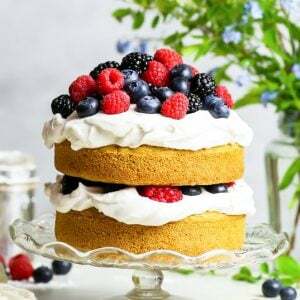 Place the other sponge cake on top of the berries, and spread the rest of the frosting on top of it. Top with a heap of berries, and enjoy! The gluten free vegan vanilla cake keeps well in a tightly closed container (or wrapped in cling film) in a cool dry place (even the fridge) for 1 - 2 days. After that, it tends to dry out slightly. Looking for more sweet VEGAN awesomeness? I’ve got you covered! Our store bought Gluten Free four mix already contains Xanthan Gum. So I’m not sure if I should be adding any at all. Are you adding extra in your recipes for the hold or does your mix not have the Gum included. The cake doesn’t require a huge amount of xanthan, so the xanthan in the flour mix should more than suffice. So beautiful cake? Thanks!!! I’m un Argentina and what kind of mix gluten free, you recomend to make at home with other gluten free flours? Thanks again!!! 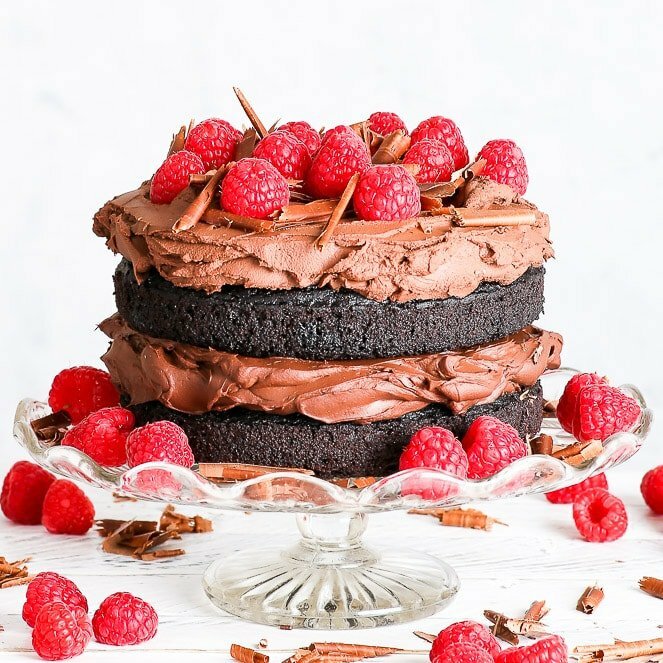 Qué hermoso pastel ♥ Y no puedo creer que los ingredientes y pasos para realizarla sean tan fáciles. Hi Kat! Thank you it does help! I have one more quick question! Hi Kat! Thanks for your help! One more quick question, can i cut this recipe in half? I am making it for just me and my boyfriend, so 8 servings will be a lot. Please let me know! Hi Caitlyn! Sure thing, you can make for instance just one layer of the cake, and top it with half of the frosting. 🙂 The recipe scales nicely, so there shouldn’t be any problems. I hope you read this before tomorrow haha. I was wondering if i could substitute the milk for orange juice, and zests for orange zest to make an orange cake? 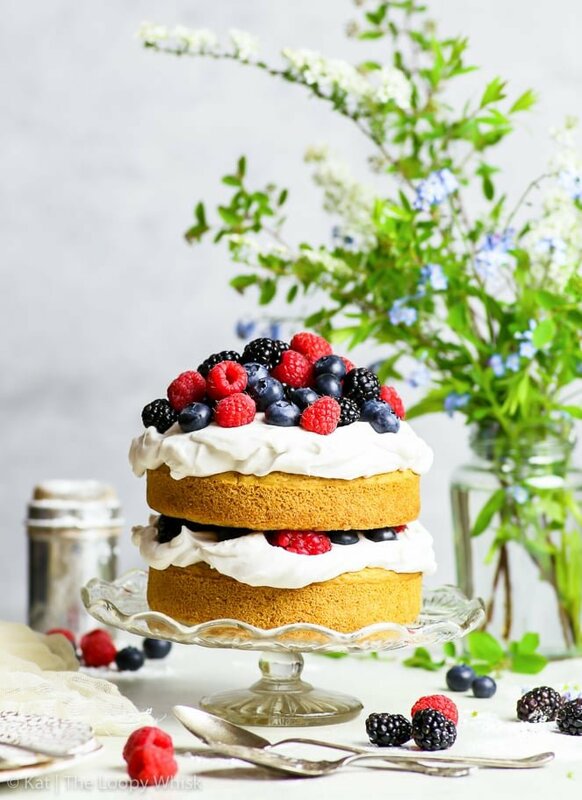 My nearly 4 year old is wanting an orange cake for her birthday and I have 3 family members that need gluten free, nut free and a vegan and this cake is the most delicious looking cake that ticks all the boxes…. except the orange part. Or should I just substitute all the lemon parts for orange and would it be strong enough orange flavour…. hope that makes sense! Hi Justine! Hope I’ve caught you in time 🙂 You should be able to substitute both the milk and the lemon zest – only with the orange juice, be sure to add it at the very last step, just before baking, so that it doesn’t react too much with the baking powder. Basically, add all ingredients, then at the end add in the orange juice, mix briefly until it’s fully incorporated and bake. Alternatively, you can use orange juice to soak the baked sponges (made with milk + orange zest). And you can also add orange zest to the frosting! My friend is allergic to citrus. Is it ok if I don’t use the lemon? Certainly! The lemon zest is there for the flavour and isn’t a crucial element of the cake. 🙂 Enjoy! I made this cake. The batter was very stiff. The cake didn’t rise. After it cooled it was hard. What did I do wrong?!!! Hi Lyn, that’s very strange – what kind of gluten free flour blend did you use? Some GF flours absorb a lot of moisture and can produce super dry and hard bakes. Also, I would check your baking powder and soda to see if they are still active. Hope that helps! This is a bit late in coming, but I did the same thing. I didn’t realise there was already xanthan gum in the GF flour mix. Adding the tsp of xanthan made the batter WAY too thick. Nothing for it but to start over, unfortunately. Yes, xanthan can be a tricky thing – always check whether your gluten free flour blend already contains it! I made this and my batter turned out more like a dry sugar cookie dough! The ratio of wet and dry seemed really off to me? Not sure what I did wrong but I did taste it and it was delicious. Thanks for sharing this recipe – I made it this weekend, but seem to have done something wrong as the finished cake, whilst looking good, tasted overwhelmingly of bicarb (baking soda). Bleuugh!! I used the exact amount in the recipe – is 2tsp definitely the right amount? I actually just made this cake following my recipe again, and definitely couldn’t taste any baking soda. Are you using a plain gluten free flour blend, or a self-raising one? If it’s self-raising, then you have to reduce the amount of raising agents used. Sorry for the long delay responding – I hadn’t realised you’d answered my question! I used Doves Farm plain GF flour, not self-raising. Does this recipe call for self raising or plain flour? I’ve just made it with SR but it tasted overwhelmingly of baking powder, so I’m assuming the recipe is with plain. I can’t thank you enough for your amazing Vanilla Gluten Free Cake recipe! Not only was it easy to make it was yummy too! I didn’t use any sweetener as I find vanilla is sweet enough! Would I be able to add chopped walnuts to make a walnut cake with coffee frosting? I was thinking if subbing some of the flour for finely chopped walnut , or would that be too heavy? You certainly can – I actually love the idea! 🙂 Let me know how it turns out. I am going to make the cake as it looks delicious, however I would like to make it as a red velvet cake. What would be the ratio of ingredients be please? Hi Gloria, the ratio of ingredients should be the same with a few drops of red food colouring and a tablespoon or so of cocoa powder. Can you make this in a 9 x 13” pan instead? This has been the best gf and vegan cake recipe I have made in a while! The texture was not too dense or gummy, and it held up nicely in the fridge while waiting to be served. I did modify the recipe a little bit by upping the sugar to 1 cup, doubling the vanilla extract and adding just a touch of almond extract too. I also used refined coconut oil and Bob’s red mill 1-1 baking mix (the one in the blue package that’s rice flour based, not the red package which is gram flour based) and it turned out great! Made it for a birthday and everyone kept going back for just *one bit* more, ha ha! This looks beautiful! I tried your vegan, gluten-free, vanilla cupcakes and they came out like a dream! So fluffy and tasty. Can’t wait to try this recipe tomorrow! Yay! 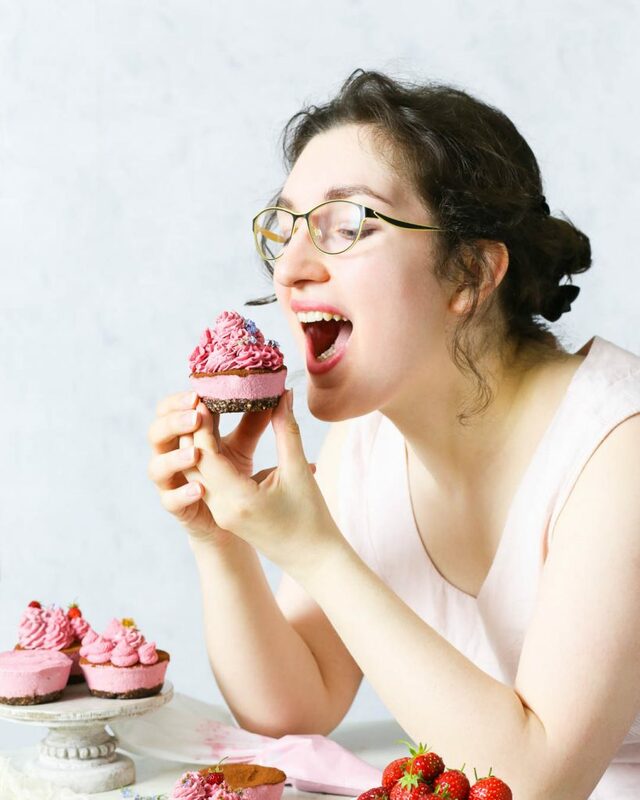 SO happy you enjoyed the cupcakes, Marina! 🙂 Hope you loved the cake as well. I have tried many GF flours and egg replacers and the cakes have always been very wet and oily ! This recipe uses no egg replacer and only 3 1/2 Tbl spoons of oil. This time I used King Arthur GF flour and there was NO grit or Oily cake!! By far the best recipe I found so far !!!! The frosting was very watery though. I’m so happy you enjoyed the cake, Vicky! I find that the egg replacers don’t have a very nice effect on the texture of the cake, so I never use them!